Lindstrom Air Conditioning & Plumbing has served Greenacres, Florida residents since 1975 and provides expert HVAC and plumbing service you can count on when you need it. We are locally owned and operated and work hard to take care of our customers in Greenacres and all over South Florida. We offer a full range of high quality HVAC and plumbing products and services to provide you with total home comfort. Day or night, we are ready to help with all of your heating, air conditioning and plumbing needs. We take great pride in making you a customer for life and will do everything in our power to ensure your complete satisfaction. We've been keeping Greenacres and South Florida homes comfortable for 44 years. Our expert AC service technicians can repair all makes and models of air conditioners, heat pumps and HVAC systems. 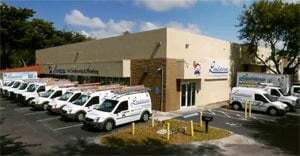 Give us a call when you need air conditioning service in Greenacres, FL! We’ve built our business around the philosophy of providing superior skills in the air conditioning, heating, plumbing and indoor air quality service industry, backed by the highest quality customer care programs in the industry. We strive to earn your trust and business, and look forward to working with you. Let Lindstrom be your #1 choice in Florida home service providers! Give us a call today or schedule service online now.